The Prince's Trust is a charity in the United Kingdom founded in 1976 by Charles, Prince of Wales to help vulnerable young people get their lives on track. It supports 11 to 30 year-old who are unemployed and those struggling at school and at risk of exclusion. Many of the young people helped by The Trust are in or leaving care, facing issues such as homelessness or mental health problems, or have been in trouble with the law. It runs a range of training programmes, providing practical and financial support to build young people's confidence and motivation. Each year they work with about 60,000 young people; with three in four moving on to employment, education, volunteering or training. In 1999, the numerous Trust charities were brought together as The Prince's Trust and was acknowledged by The Queen at a ceremony in Buckingham Palace where she granted it a Royal Charter. The following year it devolved in Wales, Scotland, Northern Ireland and other English regions but overall control remained in London. The Prince's Trust fundraising and campaign events are often hosted and feature entertainers from around the world. In April 2011 the youth charity Fairbridge became part of the Trust. The Prince's Trust is one of the most successful funding organisations in the UK and the UK's leading youth charity, having helped over 870,000 young people turn their lives around, created 125,000 entrepreneurs and given business support to 395,000 people in the UK. From 2006 to 2016, its work for the youth has been worth an estimated £1.4 billion. The Prince's Trust aims to work with young people from four priority target groups. These are the long-term unemployed, people who have been in trouble with the law, people who are in difficulty at school, and people who have been in care. These young people are considered by the Prince's Trust as being "disadvantaged". A small number of people who are employed also go on some Prince's Trust courses. Known as the employed participants scheme, it is used as a learning and development opportunity (to develop the employee's skills), as additional support to the programme's young people (the employed participants act as additional mentors or support to young people) and as a fundraising initiative (as the employer pays a training fee for their staff member to attend). Charles, Prince of Wales, founded The Prince's Trust and is now its president, a figurehead position with no legal responsibility. The Prince's Trust Council are the trustees of the charity and are legally responsible for management, administration and deciding policy. Lloyd Dorfman was appointed Chairman of The Prince's Trust Council in March 2015 following the departure of Charles Dunstone. Nick Stace, the chief executive of The Trust, joined in October 2017, replacing Dame Martina Milburn DCVO CBE who is now Group Chief Executive for The Prince's Trust. In 2010 The Prince's Trust employed 644 people, including 555 people who worked in charitable purposes and support, 87 in fundraising and publicity, and 2 in governance. The cost of employing these staff is £21 million a year and is the organisation's single biggest expenditure. This is down from the 2009 total (£22 million on 695 staff) following an efficiency drive which saw a number of voluntary redundancies. Two members of staff earned between £110,000 – £120,000. Fifteen staff earned between £60,000 – £100,000 – down from 17 staff earning these amounts in 2009. The Chief Executive of the Prince's Trust is Martina Milburn who joined the organisation in 2004. Previously she worked as the Chief Executive of BBC Children in Need. The first are young ambassadors, these are young leaders who are volunteers and support the Prince's Trust in different ways including motivating other young people and winning contributors and the media about the work the Prince's Trust do. The second are job ambassadors. These group have taken part in a Prince's Trust programme and have graduated from being a Young Ambassador. They are then employed by The Prince's Trust and work to inspire, motive and assist the young people in fulfilling the programmes they enrol in. Lastly, there are celebrity ambassadors who help raise awareness of the work that is done by The Prince's Trust in young people's lives. Celebrity ambassadors also involve themselves by visiting the young people during courses and programmes, host and help fundraising events and additionally start and support campaigns for the Prince's Trust. Past and current ambassadors include Phil Collins, Bryan Adams, Phillip Schofield, Gary Lineker, Jeremy Irons, Joss Stone, Kevin Spacey, Tom Hardy, Rita Ora, Geri Halliwell, Benedict Cumberbatch, Idris Elba, Gemma Arterton and Sharon Osbourne. In 2017, The Prince's Trust recruited Tom Fletcher and Giovanna Fletcher as the charity's first Digital Celebrity Ambassadors, following the great support they had given following their attendance at our Celebrate Success Awards. 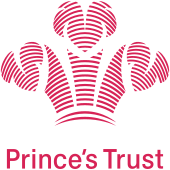 In 2009–10 The Prince's Trust charity, and its trading subsidiary, Prince's Trust Trading Ltd, had a total income of nearly £36 million, and expenditure of £38 million. Facing the impact of the economic climate and a decline in funding it drew on its reserves, which stand at £22 million, representing roughly six months operating costs. The Prince's Trust is one of the 100 largest charities in the UK ranked by expenditure. Voluntary income represented the largest source of funding for the organisation, totalling £18 million in 2009–10 (representing a very small increase on 2008–09. Public Sector income (contracts and grants to deliver support to young people from statutory bodies) fell from £17 million to just under £14 million. The cost of raising the voluntary income was £5.5 million, which means that for every £1 donated, 70p was spent on charitable activities. For the past ten years, its work is reported to be worth an estimated £1.4billion. The Prince's Trust expenditure of £38.2 million was made up of £30 million spent on charitable activities with the rest being spent on administration and other costs. The £30 million spent on charitable activities was divided between the different programme areas such as the Team programme and the Enterprise programme. £1.2 million went on grants to young people and institutions. The Prince's Trust has seven main types of charitable activity. The Enterprise programme helps young people start a business. The Team Programme is a 12-week personal development course, offering work experience, practical skills, community projects and a residential week. Get intos are short courses offering training and experience in a specific sector to help young people get a job. Get Starteds are short courses that give people the chance to take part in a week of activities to grow their confidence and skills. Fairbridge offers a mix of group activities and one-to-one support for young people. Development Awards are small monetary grants given to young people to help them get some training, education or a job. Achieve clubs are held in schools, or through the Trust's centres for those outside of education. Mosaic runs programmes in primary and secondary schools to link young people with role models to boost their confidence. The Enterprise programme is the offer for which The Prince's Trust is best known for. Helping young people to become their own boss by starting a business, 18 to 30-year-olds are given practical, mentoring and financial support of up to £5,000. As part of the programme, each young person is appointed a Business Mentor who provide one-to-one support for up to two years to develop and grow their business, acting as a sounding board to share thoughts and concerns, as well as empowering them to make their own decisions. The Prince's Trust has helped 86,845 young people to set up in business since 1983. In 2017, The Prince's Trust launched Enterprise Online, to enable 18 to 30-year-olds to explore becoming their own boss, learning at their own pace with dedicated support along the way. From developing quick pitches to get investors interested in your business to marketing strategy advice to bring in sales, it has everything young people need - including access to e-mentors to help them achieve their goals. Team is a 12-week personal development programme which gives young people that are NEET (Not in Education, Employment or Training) and aged 16-25 the chance to gain new skills, complete a qualification and meet new people through team-building activities, a residential trip, community project and work placement. The course is usually run by a local organisation known as the delivery partner. 205,063 young people have participated in our 12-week Team programme since its launch in 1990. The people going on Team are usually unemployed, and if they are receiving JobSeekers' Allowance and other benefits they are still able to receive these whilst on the course. People going on the course also get their travel expenses and other costs paid. Some people in employment also go on part of a course but their employer has to pay a course fee of £1,250 to The Prince's Trust. The Prince's Trust employs fundraisers with "proven sales experience" to persuade employers to pay for their employees to go on the Prince's Trust Team Course. In 2006/7 the Prince's Trust received nearly £687,000 from employer's fees for Team courses. As part of the programme participants go on a trip to an outbound activity centre where they focus on communication, teamwork and confidence building. Later in the programme they work on their Maths and English skills, and give back to their local community by volunteering, raising awareness and fundraising for causes that matter to them. Participants also complete a two week work experience placement. Get intos are short courses that give young people experience and training in a specific sector, to allow them to gain employability skills to move into work. Focus industries include retail, construction, logistics and hospitality. In 2017, The Prince's Trust launched Employability Online, to enable 18 to 30-year-olds to gain the essential skills they need to secure the job they want. From understanding what job is right for you to tips on making your CV stand out, it has everything young people need - including access to e-mentors to help them achieve their goals. Get Started s are short courses that give young people the chance to take part in a week of activities that allow them to develop skills with help from industry experts. Working with partners including the Premier League, ASOS and Sony, they work towards a group challenge while developing skills and confidence. The Fairbridge programme offers a mix of group activities and one-to-one support for young people to develop the skills and confidence they need to move forward. Starting with a five-day Access course, delivered from one of The Trust's 18 centres across the UK, they also take part in a residential trip. Once the Access course is complete, young people choose from a range of activities, from sports to drama and photography to cooking, to help them reach their goals. In 2016, L’Oréal Paris partnered with The Prince's Trust to transform self-doubt into self-worth by developing a confidence training course for the Fairbridge programme, covering: relationships, body language and employability. The Prince's Trust education programme, Achieve (formerly known as xl clubs) provides young people at risk of underachieving and exclusion the chance to try new activities to boost their confidence, while gaining a recognised qualification. Delivered in schools, youth centres, pupil referral units, youth offender institutions and Prince's Trust centres, the course allows young people to explore personal and social development; life skills; active citizenship; enterprise; and skills to prepare them for work. In 2006/7 the Prince's Trust spent £4 million on the xl programme and of this £298,000 consisted of grants to clubs, £1.26 million was spent on Prince's Trust staff costs and £2.3 million on other direct costs and support costs. The Prince's Trust Development Awards remove young people's financial barriers to enable them to take the next step into work, education or training. Covering course fees, transport or equipment, eligible young people can receive up to £500. Mosaic moved into The Prince's Trust in April 2016. Its programmes – which run in primary and secondary schools and prisons and include an Enterprise challenge competition – aim to bridge the aspirations-attainment gap by linking young people with inspirational role models and helping boost their confidence, self-efficacy and long-term employability. The Jason Kanabus Fund was created from the £2.5 million left to the Prince's Trust by Jason Kanabus, a young farmer in Sussex who died from cancer in July 2006. He left his money to The Prince's Trust, with the request that the income was used to help young people become established in farming. Celebrity Ambassador Gemma Arterton at The Prince's Trust Awards. The Prince's Trust celebrates the achievements of young people each year through its Prince's Trust Awards (formerly known as Celebrate Success Awards). Sponsored by TK Maxx and HomeSense, these series of awards events are an opportunity to pay tribute to the bravery, determination and sheer hard work that the young people demonstrate. The process begins each summer when staff, volunteers, partners and supporters nominate the exceptional young people they’ve met. In each of the regions and countries, judging panels select finalists in seven award categories. Throughout the autumn The Trust holds 11 Oscar-style regional award ceremonies across the country before hosting a national final in London where the red carpet is rolled out. Hosted by Ant and Dec and attended by a range of celebrity ambassadors, including Thierry Henry, Gemma Arterton and Emilia Fox, it recognises the Young Achiever of the Year, Young Ambassador of the Year and many more. The Prince's Trust obtains money from two main sources. Firstly, there is the income received as a result of the charitable activities it undertakes, and secondly it raises voluntary income. 87p in every £1 donated to The Prince's Trust is spent on charitable activities. This totalled nearly £16 million in 2007/8 and was mostly contract payments for courses, training, mentoring and other services. Of the £16 million, nearly £2 million came from local and national government, over £9 million from other public sector sources, nearly £4 million from the European Union and £753,000 from the Community Fund. It is unclear how much money in total came from the European Union (EU), as although some money (£4 million) is declared as coming directly, other money can be channelled indirectly through other organisations. Previously much of the EU money for the Prince's Trust came from the European Social Fund (ESF) and could only be spent to help young people who are Not in Education, Employment or Training (NEET). Some of the ESF money went directly to the Prince's Trust (£816,000 2006/7), but mostly it went to the Learning and Skills Council (LSC) who "doubled it up" with government money that then had the same restrictions placed on it. Some LSC money was given directly to the Prince's Trust (£1.3 million 2006/7) but the majority went to the regional LSC offices who took out contracts with the regional Prince's Trust offices to provide services for unemployed young people. The ESF money was channelled through so many routes it is difficult to determine how much it amounted to, but in 2006 the funding provided by the LSC to the Prince's Trust in total came to approximately £11 million, although clearly these figures have decreased somewhat in recent years. The voluntary income raised in 2007-8 was more than £20 million, consisting of £5.2 million from charitable trusts, £4.7 million in corporate donations, £4.5 in individual donations and £2.1 million donations in kind. Leadership Groups are an important part of the trust's fundraising from individuals. These groups are made up of successful (i.e. rich) individuals within certain business sectors, such as the Technology and Construction sectors. The aim with these groups is that the individuals not only give donations, but also that they encourage employee donations and volunteering from within their organisations. The trust still has some fundraising events, including a Rock Gala that aired on 25 December 2010 on DirecTV. In 2012, the Prince's Trust was one of the main beneficiaries of Bob Finch and Michael Holland's Oil Aid. 1976 The Prince of Wales launches the charity. 1982 The charity's first ever fund-raising concert was held on 14 May at the NEC Arena in Birmingham and was headlined by Status Quo. 1986 The Prince's Trust All-Star Rock Concert is held at Wembley Arena to celebrate the first 10 years of the Trust. 1988 An appeal costing £40 million is launched for the Prince's 40th birthday year. 1990 The Prince's Trust Volunteers programme is launched. 1996 First rock concert in Hyde Park. 1997 The Prince's Trust celebrates its 21st birthday with a special variety show at the London Palladium theatre. Hosted by David Frost and Joanna Lumley, the show featured, amongst others, the Spice Girls and the Manchester United side, led by their manager, Alex Ferguson. 1999 Trust charities are brought together as The Prince's Trust. This is recognised by HM The Queen at a ceremony in Buckingham Palace, when she granted it a Royal Charter. 2000 The Trust is devolved. Wales, Scotland, Northern Ireland and each of the English regions now has its own Director and Council but overall control remains in London. 2002 BBC News and general media outlets report on Dee Narga's high-profile tribunal claim. The former Asian, Prince's Trust, divisional director claimed she suffered sexual discrimination and unfair constructive dismissal. 2003 The Prince's Trust loses appeal in high-profile tribunal case, former, black Manchester City football star Darren Beckford, suffered racial discrimination and victimisation by a director and assistant director at the Trust. He was brought in to lead a project in Manchester for black and Asian young people under the title "Don't Let Us be a Minority". 2003 The 10,000th Development Award. 2003 Volunteers programme renamed Team programme. 2003 Prince's Trust Council restrict help to four "core groups" of young people. 2006 The Prince's Trust turns 30 with a Birthday concert at the Tower of London presented by Cat Deeley, an ITV1 documentary, The Prince of Wales: Up Close, a live televised event on ITV1 presented by Vernon Kay, Kate Thornton, Patrick Kielty and Ben Elton and TV presenting duo Ant & Dec conducting the first interview with all three princes, Prince Charles, Prince William and Prince Harry. 2008 Controversy over the legacy of Jason Kanabus of the Sainsbury family . 2008 25th anniversary of the Enterprise Programme. 2009 The Prince's Trust is criticized for making a donation of £10,050 to the Conservative Party via Women2Win. The Charity Commission investigates whether The Prince's Trust has broken charity law. 2009 Controversy over Jason Kanabus Fund & spending of donation. 2010 The Rock concert made a return to the Royal Albert Hall with a sell-out performance and 3D coverage on television. 2011 The Trust merged with another youth charity, Fairbridge. 2012 Singer Will.i.am donated £500,000 to The Trust, to fund education, training and enterprise schemes with a focus on technology and computer skills. 2013 HRH The Prince of Wales opened the new Prince's Trust Cardiff Centre. 2014 Singer Beyoncé's global campaign #BeyGOOD raised more than £85,000 for The Prince's Trust to help change the lives of disadvantaged young people in the UK. 2016 The Prince's Trust celebrates its 40th anniversary, airing a documentary titled When Ant and Dec Met The Prince: 40 Years of The Prince's Trust on ITV, presented by Ant and Dec, interviewing the Prince, his wife the Duchess of Cornwall and sons. Since establishing in 1976, The Prince's Trust has helped over 870,000 young people turn their lives around in the UK through money and advice from the charity and returned £1.4 billion in value to society through in the last 10 years alone. ^ a b "Our People". princes-trust.org. Retrieved 2 November 2016. ^ "Education and Young People: The Prince's Trust". princeofwales.gov.uk. Retrieved 15 April 2016. ^ Callander, Rebecca Burn (7 September 2013). "Prince's pride as charities inspire 125,000 to start their own business". The Sunday Telegraph. Retrieved 14 September 2013. ^ a b "Idris Elba reveals how the Prince's Trust changed his life as it celebrates 40th anniversary". mirror. Retrieved 2 November 2016. ^ "Crime Reduction". Retrieved 15 August 2008. ^ "Nottinghamshire Fire & Rescue Service Charity Partnerships". Retrieved 4 August 2008. ^ "Prince's Trust: putting trust in the young". Daily telegraph. 24 March 2013. Retrieved 15 July 2018. ^ "Prince's Trust Accounts 2007 Page 13". UK Charity Commission. ^ "Nick Stace joins The Prince's Trust". Prince trust. Retrieved 12 July 2018. ^ "Prince's Trust Accounts 2010 Page 31". UK Charity Commission. ^ "Prince's Trust Accounts 2010 Page 32". UK Charity Commission. ^ "CEO of BBC Children in Need to lead the Prince's Trust". ^ "Young Ambassadors". princes-trust.org. Retrieved 8 May 2016. ^ "Meet the Job Ambassadors". Retrieved 8 May 2016. ^ "Celebrity Ambassadors". princes-trust.org. Retrieved 8 May 2016. ^ "Rita Ora joins Geri Halliwell and Tom Hardy at The Prince's Trust Celebrate Success Awards". Evening Standard. 7 March 2016. Retrieved 8 May 2016. ^ "Prince Charles hosts party to thank Trust celebrity supporters". The Daily Telegraph. 8 September 2009. Retrieved 8 May 2016. ^ "David Haye becomes Prince's Trust Ambassador". princes-trust.org. Retrieved 9 May 2016. ^ "Idris Elba's inspiring story: I came from nothing... The Prince's Trust made me the man I am today". Mirror. 13 August 2013. Retrieved 9 May 2016. ^ "Prince's Trust Accounts 2010 Pages 13 & 19". UK Charity Commission. ^ "Prince's Trust Accounts 2010 Page 19". UK Charity Commission. ^ "Practical advice for business". 18 April 2000. Archived from the original on 21 July 2012. ^ "Prince's Trust Team Work Programme for Unemployed 16-25 Year Olds". cxk. Retrieved 14 February 2019. ^ "Nottinghamshire Fire & Rescue Service". Retrieved 30 June 2008. ^ "Prince's Trust Current Vacancies". Retrieved 21 June 2008. ^ "Last Chance to Sign Up for Prince's Trust Programme - Thanet & Ashford". cxk. Retrieved 14 February 2019. ^ "Prince's Trust proves to be a jewel in the north east crown" (PDF). LM3 project. ^ Smith-Squire, Alison (26 May 2007). "Daily Mail 26 May 2007". London. ^ "European Social Fund in England 2007–2013". Retrieved 15 April 2008. ^ "House of Commons Hansard Written Answers 11 Jan 2006". Retrieved 15 April 2008. ^ "Welcome to Oil Aid 2012". ^ "The history of the Prince's trust". princes-trust.org.uk. Retrieved 30 July 2015. ^ "Prince dogged by hunt issue". BBC news. 1 November 1999. Retrieved 8 May 2016. ^ "Where we work". princes-trust.org. Retrieved 8 May 2016. ^ "Former Prince's Trust director 'slapped'". BBC News. 18 June 2002. Retrieved 27 November 2009. ^ "Article: Slap costs Charles' Trust £10k". AccessMyLibrary. 16 October 2002. Retrieved 27 November 2009. ^ "Prince's Trust loses race appeal". BBC News. 19 February 2003. Retrieved 27 November 2009. ^ exclusive by james ducker (19 February 2003). "Star fired from charity for being black". Manchester Evening News. Retrieved 27 November 2009. ^ "Team is a 12-week personal development course, offering work experience, qualifications, practical skills, community projects and a residential week". Prince trust. Retrieved 25 July 2015. ^ "Prince's Trust Accounts 2004". UK Charity Commission. Retrieved 27 June 2008. ^ Booth, Robert (13 February 2008). "The grocer v the Prince: Sainsbury heirs take on royal charity over £2.5m legacy". The Guardian. Retrieved 6 July 2014. ^ Goslet, Miles (23 March 2008). "Bill Gates 'reneges' on £1m donation to Charles's charity". The Daily Mail. Retrieved 6 July 2014. ^ Andrew Pierce (15 March 2009). "Prince Harry's charity saved from crisis by Lord Ashcroft donation". Telegraph. London. Retrieved 13 April 2009. ^ Paul Jump (10 March 2009). "Prince's Trust investigated for 'Tory donation'". Third Sector. Archived from the original on 18 July 2011. Retrieved 13 April 2009. ^ "Charless-Trust-thwarts-dying-wish-Sainsburys-heir-died-tragically-young". Daily Mail. London. 27 July 2009. Retrieved 1 August 2009. ^ "Will.i.am makes big donation to Prince Charles' charity". cbs news. 21 June 2012. Retrieved 30 July 2015. ^ "His Royal Highness The Prince of Wales officially opened the new Prince's Trust Centre in Cardiff as part of his week-long visit to Wales". July 2013. Archived from the original on 19 March 2015. Retrieved 30 July 2015. ^ "Beyoncé's global campaign #BeyGOOD has raised more than £85,000 for The Prince's Trust to help change the lives of disadvantaged young people in the UK". princes-trust.org.uk/. April 2014. Retrieved 30 July 2015. ^ "Prince Charles reflects on 40 years of The Prince's Trust". BBC. Retrieved 15 April 2016. ^ "Learn business skills with Prince's Trust Online". princes trust. Retrieved 12 July 2018. ^ "eBay and The Prince's Trust Unite". Retrieved 8 December 2018. ^ "Cheryl & L'Oréal launch stunning new lip kits". Retrieved 12 July 2018. ^ "Muse announce special gig at Royal Albert Hall". Retrieved 5 December 2018. Wikimedia Commons has media related to The Prince's Trust. Prince's Trust YouTube channel Flash Video player required. Charity Commission. The Prince's Trust, registered charity no. 1079675. This page was last edited on 27 March 2019, at 02:34 (UTC).